Jigsaw Sudokus (also known as Irregular, Nonomino, or Geometric Sudoku) are very similar to regular Sudoku puzzles, but instead of 3x3 blocks, they are divided into irregular jigsaw-like shapes. Each row, column and jigsaw shape contains all of the digits 1 thru 9. Here's a short tutorial to help you get started on these puzzles. 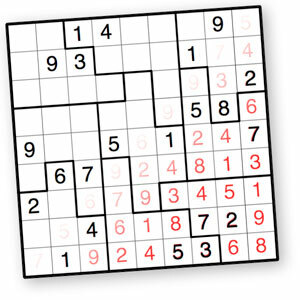 My Jigsaw Sudoku puzzles are collected in 100 printable booklets per volume. Within each volume, the puzzles are also ordered by ascending difficulty. Each booklet contains eight puzzles, hints, and answers. These puzzles require basic Sudoku strategy. In addition, you may find it helpful to acquaint yourself with the Law of Leftovers. These puzzles take longer to solve than the Intermediates. Tough puzzles require more advanced Sudoku strategy, such as X-Wing, XY-Wing and Swordfish. They also make greater use of the Law of Leftovers. These are the toughest Jigsaw Sudokus I make, and may require a little trial-and-error to finish. The hints are puzzles grids that contain numbers showing the order in which the squares were solved by the computer. Although this is not necessarily the order you would solve the puzzle, it's probably pretty close.